The many writing problems in Christopher Paolini’s Brisingr distract from the interesting story and life-like characters. In comparison with the first two books of the Inheritance Cylce, the third one doesn’t seem as natural or fluid. The story begins with Eragon and Roran attempting to rescue Roran’s fiancée, Katrina, and her father, Sloan, from the Ra’zac. After the successful rescue mission, Eragon’s many different problems begin to take shape. He travels across Alagaësia and Surda battling his brother and arch-enemy, Murtagh, defending himself against an assassination attempt, completing his training and fighting a war for freedom. He also faces many internal struggles, wrestling with the desire to better understand himself, with his feelings for Arya, with the choice to somehow free Murtagh from corrupt Galbatorix’s control, or to defeat him once and for all in battle. Paolini takes elements from other fantasy writers, especially J.R.R. Tolkien, to form the basis of this series. As in Tolkien’s Lord of the Rings, there are elves, dwarves, and men; an underdog hero, Eragon; and an all-powerful enemy, Galbatorix. While this could lead to an overused plot, Paolini uses fresh ideas and details, along with his highly developed characters, to weave a new and exciting story. The main characters in the book, Eragon, Saphira, Roran, Arya, Nasuada, and Murtagh, bring the story to life. Their complexities and inner-struggles make these fantastical characters real. Eragon and his dragon Saphira are the best and only hope of the Varden, but they are tired of a life surrounded by death and destruction. Roran leaves the shadows of his cousin’s fame to create a name for himself in the leagues of the Varden. Arya is a striking, deadly Elven warrior with a softer side. Nasuada longs for a normal life, but knows that “defeating Galbatorix is far more important than something as trifling as marriage.” Murtagh is a slave of Galbatorix’s will, but does not want to be the monster his master forced him to become. 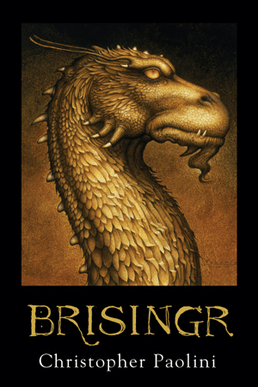 Brisingr overflows with plot-twists that show Paolini’s great story-telling abilities. One twist appears with Fadawar’s challenge of Nasuada for leadership of the Varden. Their culture demands that the two decide the challenge with the Trial of the Long Knives. In the Trial, the two take turns cutting their inner-forearms. Whoever makes the most cuts before passing out wins, and whoever wins gains control of the other’s tribe. Many questions raised in the first two books are answered in Brisingr. Eragon learns of his true parentage, Arya’s past, the history of the Forsworn and the reason why Galbatorix and Murtagh are so powerful. He made each detail well designed and interesting. All of this greatness, however, hides beneath the bad writing. In Brisingr, Paolini’s style is often pedantic and stilted. He tries too hard to prove he is a good writer, that the first two books were more than beginner’s luck. Even though Paolini wrote this book for young adults, the vocabulary he uses seems too educated. He uses words like “visage,” “bedeviling,” “dullard,” “potentates,” “prognostications” and “bilious” when simpler words should have been used instead. In his quest to create innovative, poetic descriptions, like “swagger sticks,” “shapeless howl,” “impartial stars,” “the bloated sun,” and “a longish while,” he often misses the mark, and leaves the reader confused. Paolini wrote Brisingr from the eyes of four different people (Eragon, Roran, Nasuada and Saphira), and the style changes slightly with each. This difference is most painfully obvious from Saphira’s perspective. All the problems with the writing style thrive in these chapters, like this description of the morning weather, “The wind-of-the-morning-flat-land, which was different from the wind-of-the-morning-heat-above-the-hills, shifted,” or a description of the Varden themselves, “The Varden had arrived at the crossing yesterday, and since then, perhaps a third of the men-who-were-friends and the Urgals-who-were-friends and the horses-she-must-not-eat had forded the river.” It feels awkward to read these passages, as the writing is so strange. Brisingr, Christopher Paolini’s newest installment in the Inheritance Cycle, exemplifies both great story-telling and bad writing. The complex characters and interesting plot get bogged down by a story told from too many perspectives, the complicated syntax, too many adjectives, and strange words. Overall, the novel failed to impress.